Full of Eastern promise, this inventive new version brings Ali Baba well and truly into the world of pantomime! One of the less commonly performed panto titles, this innovative script makes new footsteps in the sand, whilst firmly embracing the spirit of the original Arabian Nights tale. The riveting storyline, along with heaps of comedy, spectacle and traditional business are sure to enthrall young and old alike. There are many strong character parts, including Dame Fatima Fandango (a former belly dancer), whilst the Chorus are kept very much involved, having the opportunity for some character acting and rousing numbers as the Thieves. This exceptionally witty script also includes a very original ultra-violet scene (optional) and has proved itself to be remarkably flexible. Whilst it has been performed many times in village halls, there’s plenty of scope for the more ambitious to get their teeth into. One production reached an audience of over 60,000 and had 3 live camels on stage! 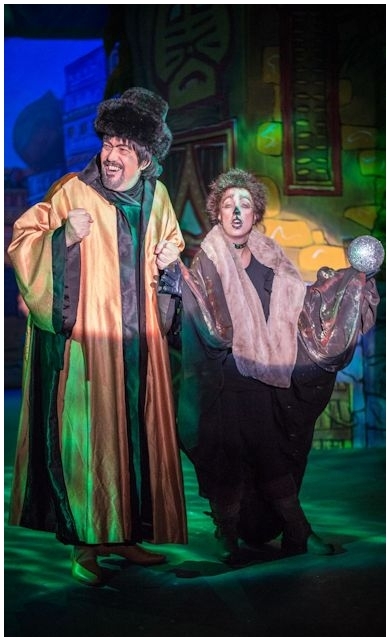 Many productions of this script have won NODA and drama federation “Best Pantomime” awards! We also offer a “larger cast” version of this script with 3 Hand Maidens to the Princess (small speaking parts), plus another slightly simplified version for schools or youth theatre groups (needing only 2 full stage scenes). Both these versions also have additional lines for Chorus members. For a Reading Copy of either of these alternative versions, please select Ali Baba & the Forty Thieves and specify the version you require in the message box on the order form. Let’s take a breather. What’s that you’ve got in your bag? (Taking out a thermos flask) Oh, Mistress Fatima lent me her thermos flask. (Proudly) It keeps hot things hot and cold things cold! Yes, I know – and what have you got in it? … and a couple of choc-ices! What, out here in the middle of nowhere? Quite a gang by the sounds of it. Well done, my men – that was a raid to be proud of! And what better way to welcome our two new members, Bashim and Grabbit? (Approaching Asbad) I think I’m going to enjoy my new job as one of your in-laws! In-laws? You mean outlaws, stupid! … Oh, I can’t wait until you two are trained robbers. You mean like Ronnie Biggs? No – trained robbers, not train robbers! (Also to Asbad) And by the way, I didn’t see that bacon tree you told us about back there. Don’t be daft, Bashim – he said an "ambush", not a "ham bush"! (Bemused, to audience) Ever heard the saying “As thick as thieves”? These two give it a whole new meaning, don’t they? (To the Thieves:) Now, come on men, bring me all the booty – I can’t wait to show it to the Evil Queen when she arrives. (Inspecting the loot) My, my, Asbad – we have done well for ourselves, haven’t we? We do aim to please, your Evilness. Well, don’t just stand there gloating – get it stashed away with the rest of our stockpile. Don’t call me Chum. I’m not a dog’s dinner! That’ll do! Show some respect for my Pedigree! Yes, of course – when at Crufts, you do tend to “win a lot”! (Aside, to audience:) Winalot! GRABBIT: Two scoundrels who are recruited by Asbad. DANCERS: Featured in musical numbers as desired. Also play the Spirits of the Cave, the Royal Entourage and perform the optional ultra-violet scene. It is possible to avoid one full stage set, playing Act II Scene 3 in the market place, as Act II Scene 1. In this case, just 4 different full stage scenes are required, plus a Kitchen front cloth or a set of mid-stage Tabs. However, for a slightly shorter version of this script needing only 2 full stage sets, please order the “youth version” as described above. On the other hand, there are plenty of opportunities in this script for the more ambitious, who will have 5 full stage scenes and use front cloths for some or all of the front of Tabs scenes. "...A welcome break from the tired old versions that crop up at least two per story every season. This was a show cram-packed with ideas and jokes, as well as songs, routines and a very strong storyline..."
"...As a veteran of many years of pantos in Dereham, I've no doubt this was the best I've seen. The show was packed with energy, sparkle, audience participation, magical special effects and, of course, bucket loads of jokes and puns." "...This was just one of some very innovative touches from a very original script (Stage Right Creative Ltd). Comedy there was in plenty and the scenes between Bashim and Grabbit were sheer delight. The same could be said of Fatima – the scenes with these 3 and Mustafa were hilarious!" 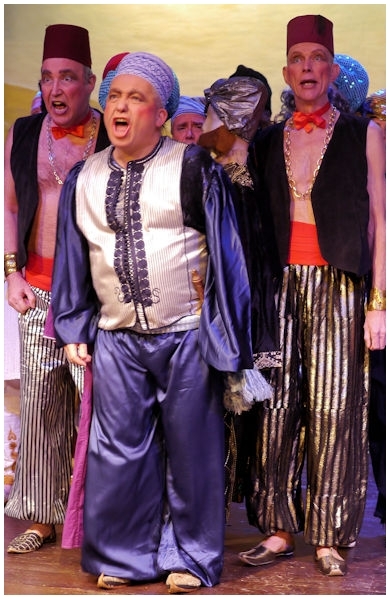 "...Holybourne Theatre Company has been delighting packed houses with a traditional family pantomime. Ali Baba & the Forty Thieves was a triumph of imagination, quick-witted one-liners and fun." "...A new script from Alan Frayn plays down the blood-thirsty elements and with the addition of a comedy Dame and a generous helping of other comedy characters, a creditable panto emerges, which captures the spirit and magical atmosphere of the Far East. This memorable show contains many unforgettable Turkish delights and is chock full of Eastern promise."